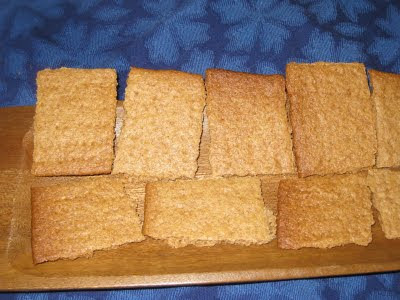 So how did I end up making graham crackers from scratch? Funny you should ask. I have always been fascinated by them. They were one of the few cookie-type products that we had in our house pretty much all the time. For a quick dessert or if we were out of cereal, my mother would put some in a bowl and cover it with milk. The trick was to eat it as quickly as possible before the graham crackers became a wet soggy mess. I was fascinated by this process because, until you put your spoon under it and tried to pick it up, you never knew for sure whether it would stay intact or not. And you wonder where I got my taste for soggy, mushy food. Graham crackers were developed in the early 19th century by Sylvester Graham, a Presbyterian minister who promoted vegetarianism (among other things) and decried the practice of adding chemicals to bread. Like the Kelloggs, Graham believed that people should only eat bland foods, and stay away from unhealthy urges. The graham cracker was developed to offer a somewhat sweet, but still healthy, treat to help people suppress those unhealthy appetites. Ironically enough, most commercial graham crackers today are made from the very refined white flour against which he campaigned, and have all kinds of chemical additives. I only buy them when I want to make graham cracker brownies these days, and I buy Annie's Honey Bunny Grahams, which are still made with whole wheat and fewer additives (can't say none because I don't know what those "natural flavors" are on the ingredient list). They work just fine for the brownies. I hadn't made whole wheat bread in a while, and I decided to make some not long ago, but I didn't have enough whole wheat flour. So I put it on my shopping list. At the store, I was looking at three brands - King Arthur, Bob's Red Mill, and Hodgeson Mill. I had used both King Arthur and Bob's Red Mill, so I thought I would try Hodgeson Mill. I put it in the cart and brought it home with me. Imagine my surprise when I got the bag home and noticed a section on the back of the bag titled "History of Graham Flour." Huh? I didn't buy the wrong thing, did I? I looked at the front of the bag - "100% Whole Wheat Flour." No mention of graham at all, until I looked more closely, where it said at the bottom: "Graham Flour Story on Back." Long story short? Graham flour is whole wheat flour. The only thing that differentiates this bag of flour from what I usually buy is that this flour is much more coarse than the others. The minute I opened it up and started working on the bread I knew it would affect the final product. It was thicker, and heavier. It did not knead as smoothly. It did not rise as high. But it did knead, and it did rise. As I was working with it, I told myself if the bread did not turn out as well as it usually did, then I would just make some graham crackers with it, since I wouldn't be using it for anything else. And that's how I ended up making graham crackers. I found a recipe at homecooking.about.com that was reprinted from Retro Desserts: Totally Hip, Updated Classic Desserts from the '40S, '50S, 60s and '70s by Wayne Harley Brachman (William Morrow, 2000). I tweaked it a bit, and by the third attempt (thus validating my Law of Three theory), found the perfect blend of ingredients and technique. They may not look symmetric or even-edged, but I can tell you they are spectacularly delicious. And not just "Wow these are pretty good for a healthy treat" delicious. They are light and crunchy and almost melt in your mouth (yes, even with all that coarse whole wheat). There is a complexity to the sweetness, thanks to the three different sweeteners used, but the sweetness is not at all overpowering. These are so good that I want to use them for my graham cracker brownies but I don't want to waste them. What does that tell you? I won't lie, they are a bit of a bother to roll out and get on to the baking sheets. But they are well worth the effort. You can even make them in two stages - make the dough, roll it out to the first thickness, and then leave it in the fridge for anywhere from an hour to 24. You could probably even freeze the dough. You could definitely freeze the cookies. I'm telling you, if you want to impress your friends, get some old fashioned 100% whole wheat flour and whip up a batch. The original recipe calls for 1/2 cup of rye flour. Since I don't use that, I didn't want to buy it just for this purpose, so I just upped the amount of the whole wheat flour. At some point I will probably try it with the rye flour, though, because that just seems to be where I'm heading. You may also be tempted to omit the cinnamon; I did with the first batch I made. It was definitely better with it. You can't really taste the cinnamon, but it acts as a flavor enhancer that adds to the sweetness, somehow. I would definitely leave it in. Combine the flours, sugar, baking powder, baking soda, salt and cinnamon in the bowl of a food processor. Pulse a few times to mix them together. Add the cold butter and pulse until the mixture resembles coarse meal, about 20 seconds (no more than 30). Add the honey, molasses, water and vanilla. Pulse just until the dough comes together into a ball, another 20 seconds (again, not more than 30). Turn the dough out onto a piece of waxed paper. Cover with a second piece of waxed paper and roll the dough out 1/2-inch thickness, being careful not to roll it outside of the boundaries of your baking sheet. Place the waxed paper-coated dough on a baking sheet and chill for at least an hour or up to 24 hours. Preheat oven to 350 deg. F. Remove dough from the refrigerator and cut it into three even pieces. Let sit for 5 minutes to soften a little. Put each piece between waxed paper and roll out to a scant 1/8-inch thickness. Again, be careful not to roll outside the boundaries of your baking sheet. Line your baking sheets with parchment paper. Gently unroll the top piece of waxed paper from your rolled-out dough place it on the parchment paper covered baking sheet. Gently peel back the other piece of waxed paper. Repeat this process with the two other batches of dough. Using a sharp knife or a pizza cutter, cut the dough into 2-inch squares. Poke each cracker with a fork at least six times - three times on each side evenly. Bake for 12 to 15 minutes, until they just start to brown around the edges. Do not let them get too dark. Remove from the oven and cool on racks. Let cool completely before storing them.